Cortes, A.; Ojeda, M.; Bejar, J.; Martinez, A.
Cortés, A. [et al.]. 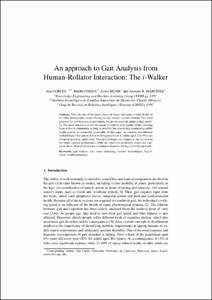 An approach to gait analysis from human-rollator interaction: the i-Walker. A: International Conference of the Catalan Association for Artificial Intelligence. "Artificial intelligence research and development: current challenges, new trends and applications". Amsterdam: Ios Press, 2018, p. 335-344.